Brandon Backe was the guest for a rare Thursday edition of Astroline on 4 January 2007. Here are my observations and commentary about the questions he was asked by Milo Hamilton and fans. Almost right after being introduced, Brandon was asked what he thought about the new signings. He said he was thrilled to have Carlos Lee on the team and all additions made in the off-season were great pickups and a great job by the management. When asked about his availability for the Astros FanFest in February, Brandon said he definitely will be there–so all you fans of Brandon’s good looks and purty blue eyes, better line up early for autographs! The next question from a fan put poor Brandon in the rather uncomfortable position of playing GM…He handled it very well and diplomatically said the Astros had made good offensive pickups so far, including the Loretta deal, but, he believes the Astros still need another bonafide starting pitcher. Backe then talked about Roger Clemens and the benefits of having him on the team for the past two years, citing that The Rocket has been a great mentor to him, teaching him many things and never shrugging him off–a sentiment echoed by Astros rookie pitcher Chris Sampson. A lighthearted question asked of Brandon brought smiles and grins from many–"Can you teach other Astros pitchers to hit ball like you?" 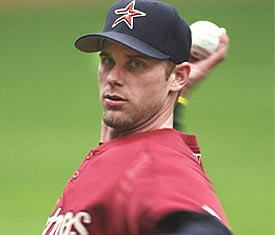 Brandon’s reply was that Roy Oswalt’s coming along pretty good; he even had a homerun in 2006. He added that Brad Ausmus is just a great catcher and Backe gives a lot of credit to him for his pitching success. When asked about the 2007 spring training in Florida, Brandon said he is planning on being there because to him, competing is his favorite thing about playing professional baseball. He admitted that at the present time, he’s not planning on adding on any new pitches and hopes to break sharper and throw harder on his current pitches and his batting will be just fine. He then added that he has already started tossing to 45 feet for about 10 minutes at a time, not off the mound as of yet, but, he’s getting there. According to Backe, the pitching and coaching staff is going to check on him in the next week or so–he mostly expects to work out with everyone in Florida for spring training and then continue working with the coaches and trainers at Minute Maid Park once the season starts. Backe is hoping to be ready for the push to post-season in September. As always, you can listen to all Astroline broadcasts here. Thanks Rita. I missed this broadcast so I was glad I got the recap from you. Keep up the good work!!!! I hope Brandon doesn’t push it too fast and hurt himself… It would be nice to have him in the playoffs, but I’d rather have him completely healthy next year than to take a chance at him hurting himself again by coming back too early. Thanks for the recap, like always I forgot about it. Linda: Thanks. I am definitely going to do the recaps for the players. I didn’t do one on Tal Smith and Tim Purpura because there really wasn’t anything interesting beyond what we all already knew. Thomas: Anytime! I too hope he doesn’t push too hard. In my original notes during the broadcast, when he said that about September, I had written down “Typical Brandon–wanting to push it as far as he can.” but decided not to use it in the blog. Loretta An Astro–Where Does This Leave Ensberg?